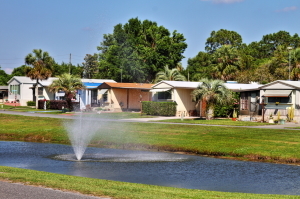 Lake Griffin Harbor is a 55+ retirement community in Leesburg, Florida featuring 65 acres of quality crafted manufactured homes, many of them available for purchase and ready for your immediate occupancy. We offer 2- and 3-bedroom models at a variety of affordable prices. Several of our manufactured homes for sale are being offered fully furnished, making them not just move-in ready but also a fantastic bargain. This form will enable you to search all of the homes currently for sale at our 55+ community in Leesburg. If you wish, you can narrow your search by price, number of bedrooms, and/or whether you’d like to purchase a home that’s furnished. You can also call us directly and speak with a member of our Lifestyle Team in more detail about the manufactured homes currently for sale at our community. We think you will find that our homes are a notch above the vast majority of manufactured housing accommodations in the Leesburg area. Perhaps more so than our manufactured homes, however, what really draws retirees to Lake Griffin Harbor is the fact that we are a beautiful lakeside community where something fun is seemingly always happening. Yes, Lake Griffin Harbor is a place to live. But it’s also a lot more than that – it’s a lifestyle. Being a resident of our 55+ community means never being without some kind interesting activity to engage in, whether it’s fishing the bass-filled waters of Lake Griffin, going on an extended boat trip, getting a group of friends together for a night of Texas hold ‘em, or participating in an instructor-led group yoga session. Our lakefront clubhouse has all the amenities that you would expect at a resort-style retirement community like Lake Griffin Harbor, including a pool, fitness center, bingo hall, shuffleboard courts, observation deck, boat ramp, boat slips, and more. Contact us today if you are searching for manufactured homes in Central FL and would like to know more about Lake Griffin Harbor in Leesburg.